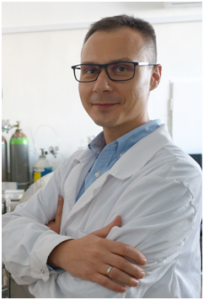 It's time to announce the first member of the 8th EYEC Scientific Commission - Artur Małolepszy from the Faculty of Chemical and Process Engineering, Warsaw University of Technology. Artur Małolepszy defended his PhD thesis 'Production and characterization of multiwalled carbon nanotubes and metal oxide functional composites for formic acid fuel cells applications' in 2015 at the Faculty of Materials Science and Engineering, Warsaw University of Technology. Since 2016 he is employed as an Assistant Professor at the Faculty of Chemical and Process Engineering, Warsaw University of Technology. He is focused on the carbon nanomaterials synthesis, characterization and searching for new applications for these nanomaterials in the field of biomaterials, alternative energy sources, electromagnetic screens and against infrared radiation. He is a principal investigator of the 'Fluorescent carbon nanodots production' LIDER IX project financed by the National Centre for Research and Development. Artur Małolepszy is the co-author of more than 30 publications in peer-reviewed international journals. In 2013 he received a team award of the first degree for scientific-research achievements founded by Rector of Warsaw University of Technology. As a reminder - the Scientific Commission is responsible for evaluating participants’ presentations. During the 8th EYEC edition the members of the Scientific Commission will be divided into three groups that will be evaluating both oral and poster presentations. At the end of the Conference, the Scientific Commission will choose 3 best presentations to be awarded in each of the two categories (poster and oral).